Meher Malik has perfectly fused belly dance and Bollywood dance to create a fusion called Bellywood, her unique signature style, and we got to learn from her! Thank you all so much for coming! We had the most fun ever at this years 6th Annual Retreat with Anasma! Check out the video that pretty much encapsulated the fun we had on the right! 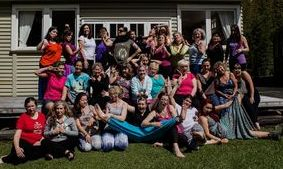 We also announced the 2017 Special Edition Retreat with the internationally renowned Sahra Saeeda who will be presenting the Journey Through Egypt Level 1 for the first and only time in New Zealand! Journey Through Egypt 1 is a 20 hour intensive course on the movement, steps, posture, clothing, history, and cultural diffusion in the different regions of Egypt. Sahra’s unique perspective follows how the dance transforms from the homes of the people to the sparkling stages of Cairo and beyond. The Joana Saahirah workshops were so enlightening - this lady is a master of Egyptian Dance and a force to be reckoned with. Thank you all so much for coming, and we hope to see you again Joana! 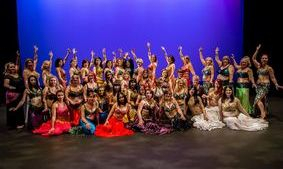 Auckland was one of 202 cities participating in the International Shimmy Mob - a celebration of World Belly Dance Day. We fundraised over $400 for the North Shore Women's Centre who do amazing work in our community! Thank you to all the dancers and supporters who got involved! To find out more about the organisation or refer someone in need, click here. What an absolute joy to host this amazing dancer! The Irina Akulenko workshops were fantastic, definitely making the most of her last stop on her Australasian tour. Thank you all so much for coming, and we hope to see you again Irina! WE. TURNED. SIX! It's been a crazy six years building this amazing company/school, and we to celebrated it in style. One of our amazing students, Kathy and her husband Ian, offered to host us on their MV Florence Dawn. Thanks guys! Check out the photos on Facebook to see the awesome sunset! Thank you all so much for braving the heat and coming along to our Summer Workshop Series! We had so much fun, and we hope you did too. Stay tuned for more workshops each season! Our fourth year running at Christmas in the Park was such a blast! We had a great time performing alongside Marley Sola, initiating our Community Troupe into the fun, and rocking out our brand new LED wings. Thank you so much to everyone who came along, and to all the fantastic performers! Every year the show gets bigger and better than ever, and this year was no exception. Thank you so, so much to absolutely everyone who came together and helped us pull it off- our tech team, our long-suffering friends, family and pets, our backstage crew, all the dancers, and anyone else we missed who carried a box somewhere, sewed bits of a costume, or gave us a hug when we were breaking down. Thank you, we love you, and we hope to see you next year! 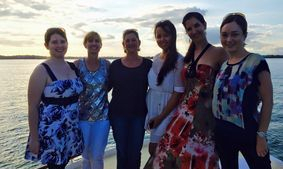 This year was a very special year for the Phoenix girls at Tarazade. 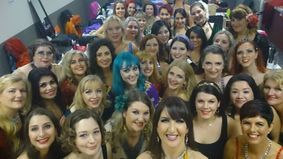 Our founder Candice Frankland was invited to teach and perform, and had the joy of performing a trio with Aziza and Helene of Norway. Candice introduced many of the festival attendees to the art of voi for the first time. In addition to that, our Phoenix troupe member Astra performed at the Open Stage, and received the prestigious (and sparkly) Trained by the Stars award, given to participants of one of the toughest critique workshops we've come across. Congratulations ladies! We're back from our amazing trip to Turkey! 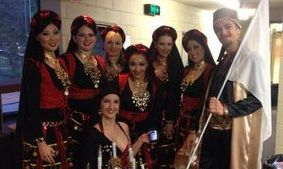 We had a fantastic time at the Tarazade festival, learning heaps from all the amazing teachers and watching the beautiful performances. 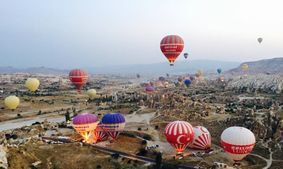 We loved seeing the rest of the country on our tour, from the ruins of Troy and Ephesus to the views of Cappadocia in a hot air balloon. Be sure to ask any of the participants for all their wild stories! Head over to the Turkey 2015 page to see some pictures and videos from the trip, or check out the Facebook page. 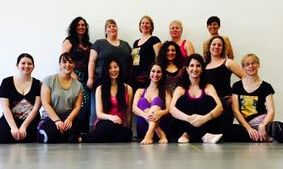 We had an absolute blast with our fantastic workshop teachers and our amazing students! Thank you to everyone who came along to Apadana on Friday, braved the wet and wild weather on Saturday, and gave up their sleep-ins on Sunday. You are all wonderful, and we hope you had as good a time as we did! Students who came to Vanessa's workshops should have received the music and video links from those workshops- if you haven't got them yet, contact Candice and she'll get you sorted. Thank you all so much for a wonderful Mid-Winter Chill Out Show! We had such a good time performing for all of you. Thank you to our wonderful students, who worked so hard on their choreography and costumes. Thank you to our guest artists for pulling out all the stops for us. Thank you to our long-suffering family and friends who helped us backstage. Last but not least, thank you to everyone who came along to watch us- without you, we're just all dressed up with nowhere to go. Thank you! 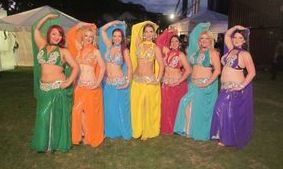 A big thank you to the marvellous Ruby Lady for coming back to NZ to show us what she's learned in her time in Sharm el Sheik! We have some new moves, knowledge, and a collection of bruises- and it was worth every penny. Be sure to come home again soon, we miss you! 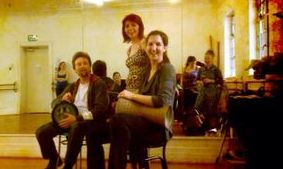 Thanks to everyone who came along to the workshops and hafla, we loved seeing you all. Thanks to everyone for coming out to the workshops with the wonderful Vanesa Moreno of Spain! We had an amazing time at the workshops and hafla, and we're so happy so many of you could make it. We'll definitely be bringing this lady back again! Our third-year running at Christmas in the Park was not without its hiccups- most notably the very wet weather! In good old Kiwi fashion though, the cast and crew pulled up their sleeves and put on a fantastic show. Thank you very much to the wonderful audience members who braved the rain and came out to see the show, and to all our fellow performers! Our end of year show was bigger and better than ever! We are so proud of all our performers for pulling off this massive undertaking, you did so well and in our minds we are hugging each and every one of you. A big thank you to everyone involved in making this show a reality- from our long suffering loved ones at home to our fantastic audience. See you next year! Belly Dance Extravaganza with AZIZA! 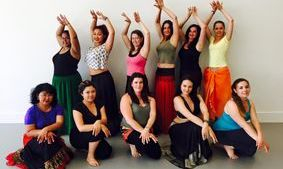 Our annual belly dance retreat was one of our best yet! Thank you so much to everyone who attended, and to all our behind the scenes helpers who worked so hard to make sure we were all looked after. Our teachers were fantastic, and a very special thank you to Aziza for coming all the way out here to teach us and take part in our fun and games! For more details on the retreat, click here. Our second annual Mid-Winter show was so much fun! It was awesome showing off our new choreographies and skills to our family and friends. We hope you had as much fun as we did, see you at the next one! A big thank you to everyone who came to the exclusive New Zealand showing of the Australian BDE show!! We had such a great time sharing this special experience with you all, especially after three days of intense workshops! If you didn't get a chance to ask the panel something, feel free to hit up our facebook page, and post your question to the wall :) Thank you! 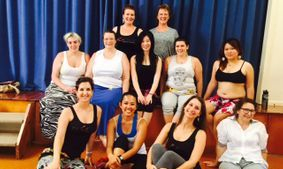 Straight from her Bellydance Evolution performance, the beautiful Kaeshi Chai visited Auckland to share her wisdom and knowledge with us! It's safe to say that all who participated came away with fresh ideas and inspiration. We also had a fantastic hafla, with fantastic performances from local dancers and Kaeshi herself. Thank you so much to everyone who helped make this event possible!! We hope to bring Kaeshi back again someday, hopefully for a little longer next time! 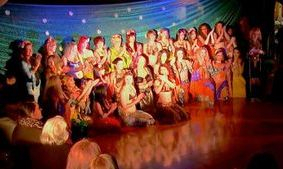 Phoenix Belly Dance has just turned four years old!!! We celebrated with a fantastic improv party and, of course, lots of cake! :) Thank you so much to everyone who turned up!! We were so excited to perform a second time for the annual Coca-Cola Christmas in the Park! What a wonderful rush to perform in front of so many people. Thank you so much to everyone who came out to watch, and to all the amazing people we got to perform alongside! Thank you so much to our amazing students for another fantastic showcase! We're so proud of each and every one of you. It was a beautiful show, with a special guest performance by ex-Phoenix troupe member Emily! We're looking forward to next year's one already. Happy holidays! A massive thank you to the Ruby Lady and Tanara Stedman for a weekend of edutainment! We learned so much and had a blast, can't wait to do it again! 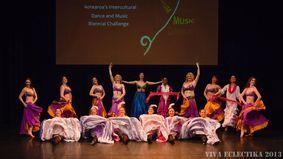 We are so proud to share the Viva Eclectika 2013 Asian Fusion Cup with Pineapple Productions and Amira Brock for our work as the World Dance Collective! 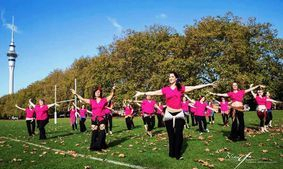 Over the past couple of months we've been collaborating with a ton of lovely ladies, learning can-can and flamenco (whilst teaching them a little belly dance) to pull off a ten minute piece showcasing feminine dance forms across the world. Thank you ladies for working with us, we had a blast! Click the button below to see the video. What a night! 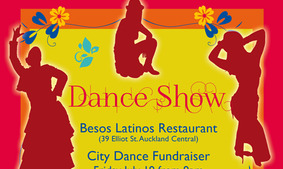 With delicious food, live music and too many genres to count, the City Dance Fundraiser was an absolute ball. Thank you so much to everyone who came along and donated to City Dance, we hope you had as wonderful a time as we did! Thanks to everyone who came along to support our first mid-year student show!! It was so much fun to be able to show you what we've been working on. A big thank you to all the students who participated, everyone involved in the show set up and pack in, the teachers, and the fantastic supportive audience. The show was such a hit that we'll definitely be doing one next year! The DVD is now available, head over to our webstore if you want to order a copy. As one of our rewards for our fundraising campaign, five Phoenix ladies pooled their knowledge for two hours of non-stop information overload! 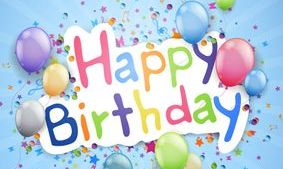 Thank you to everyone who came along and supported us, we hope you had as wonderful a time as we did. The near-superhuman Ashley Lopez joined us in Auckland for a weekend of workshops! It was an honour to host such a fantastic dancer, and real sweetie to boot. A BIG thank you to Pip E-Lysaah for helping to bring her to the Land of the Long White Cloud, and to Ashley for coming and sharing her knowledge and laughter with us. We did it! We actually did it! After a year of fundraising, choreographing and slogging our guts out, the Phoenix troupe finally made it to the Sydney Latin Dance Festival for our performance invitation! We were the international opening act (no pressure! ), and are overjoyed to report that the we brought the house down. This was such a valuable experience for us, thank you to everyone who donated and helped to make this possible!! This year, Phoenix had the privilege of being part of Coca-Cola Christmas in the Park!!! It was a spectacular event, and with a crowd of around 150,000 people, it was by far our largest live audience to date. Despite the pressure, we had an amazing time on stage performing with RIA. We're so happy that we could share the art of belly dancing with so many people! Our very own Candice Frankland returned from Turkey with a suitcase full of new costumes and a sparkly trophy to match! 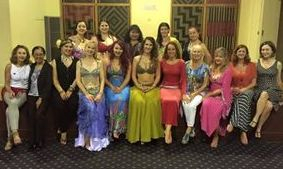 Candice attended a workshop during which she performed and was critiqued by some of the most respected and influential members of the international belly dance community. 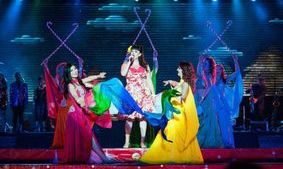 She then performed again, the challenge being to take on board as much of the critique as possible and use it to improve her second performance.